Not only can staffing agencies take a breath of relief with the recent California appellate decision in Serrano v. Aerotek, but all employers can benefit by the guidance this decision offers as it applies to meal break. In Serrano, the employee plaintiff sued Aerotek, a global recruiting and staffing agency, and Bay Bread, the worksite employer, for failure to provide lawful meal periods. Providing training during orientation, instructing employees to immediately notify Aerotek if they believed they were being prevented from taking authorized meal periods. 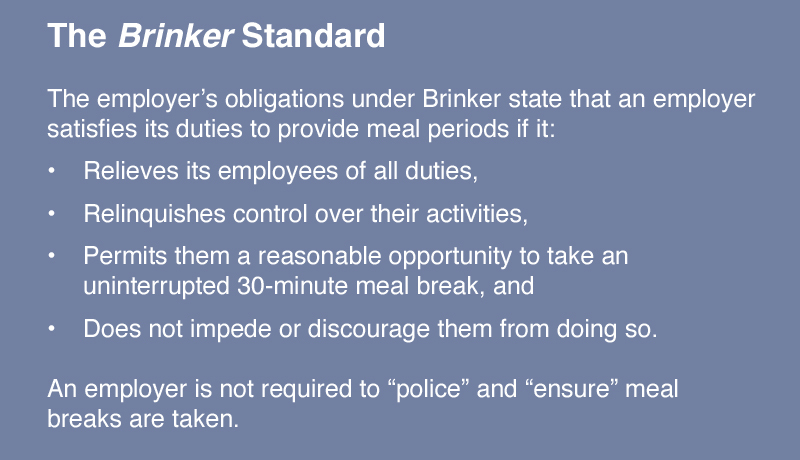 An employer is not required to “police” and “ensure” meal breaks are taken. Further, the Court went on to say that the determination of whether any employer is liable for a co-employer’s violation of labor laws depends on the scope of the employer’s own duty under the relevant statutes (such as the Labor Code), and not on principles of agency or joint and several liability. Failing to review time records or to investigate missed meal breaks does not automatically place the employer in legal violation. Time records which show missed breaks do not necessarily create a presumption of a legal violation. The employer’s actual or presumed knowledge of missed breaks may not be relevant, because the employer’s duty is to provide breaks, not to ensure that employees actually take them. Your duties under the Labor Code are not necessarily satisfied simply because you contract with a staffing agency. A Court will examine the duties of both co-employers, and liability will depend on the facts of each case. If you use staffing agencies, be sure your services agreements and contracts are properly drafted and address the obligations of both parties to maintain compliant wage and hour practices. Both parties should have written, compliant meal and rest break policies in their employee handbooks. Establish protocols for employees to report violations or difficulties with taking meal breaks. Provide training to all employees regarding these policies and protocols. Discuss and clearly define respective roles and responsibilities (scheduling and supervision temporary workers’ breaks) to insulate your company from liability. The employment law experts at RPNA are pleased to discuss the implications of the Serrano decision, how you can effectively implement the lessons taught by the decision, as well as review your employment policies and procedures to ensure your company is protected. RPNA is also experienced in workplace investigations and defending against all employment-related claims. For more information, contact RPNA at info@rpnalaw.com or 818-992-9999.